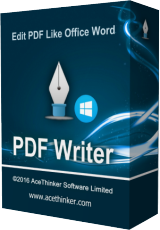 AceThinker PDF Writer is a versatile editing tool for users to work with their PDF documents professionally. It empowers you to edit the content in terms of texts, images, hyperlinks and more. You can also re-arrange, combine or remove the pages from multiple PDF files. And you may customize PDF files by creating any watermark including words and images if necessary. Furthermore, there’re options for you to protect your files with password after re-publishing them. Enjoy the experience of modifying and creating PDF like never before!